Good Morning Everyone! I'm back from New Orleans and geared up with new ideas from the Pfaff Convention and networking with other dealers! So let's get started with What's New at Creekside! What's New at Creekside Quilting? They're back! You requested them and we got them back in the store! Thanks for letting us know what you need! We are listening and try to help! This brand new Tilda book was another recommendation by a customer. 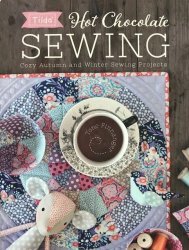 It has cute autumn and winter projects and patterns, great to make while enjoying a hot chocolate! 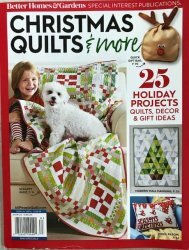 A new quilt magazine from Meredith Publishing, Christmas Quilts and More. This is the magazine's third Christmas season. As we continue to search for a in-store Pfaff repair technician, we have partnered with Des Moines Sewing Machine Company to clean your Pfaff sewing machines. You may bring your machine to the store for cleaning, and machines will be delivered to and picked up from Des Moines Sewing Machine Company for a professional cleaning on a weekly basis. 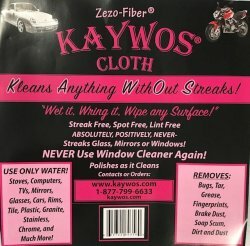 They have a 2-3 week turn around on their professional sewing cleaning services, and they are giving our customers a discounted price on cleaning your Pfaff sewing machine. I am still looking for an in-house technician...so, if you know anyone...send them my way please! Saturday, October 13th: Technique Class with Rosella Hanson. We are honored to have Rosella Hanson teaching her own pattern of The Starr Pizzazz Table Runner on Saturday, October 13 starting at 10 am! Rosella is a certified instructor with the Tucker Trimmer and this class focuses on how to use the Tucker Trimmer Ruler. The quilt table runner is beautiful, and by the end of the class, you should have a new table runner top, just in time for Thanksgiving! Pattern, ruler, and kit can be purchased at the store. Spend a Day with Stephanie Brandenburg and Frond Design Instructors! On Tuesday, October 23rd, we are going to have Frond Design Instructors and Stephanie Brandenburg in our store! We are so excited for this event! Stephanie is a native Iowan who has been designing hand generated designs for fabrics, quilts, garments, and original house decor for several years! Please visit Her Story web page to learn more about Stephanie Brandenburg and Frond Designs. We will kick off the day with a Fabric Painting Class from 10-noon. Then an Art Weave Class from 1-3 will highlight our afternoon. Stephanie Brandenburg will do a lecture, trunk show, and meet and great from 3:30-6 pm! All class fees go straight to paying the incoming instructor! Kits for the class are additional! There is still plenty of room in both classes so sign up today! What a fun day this is going to be! You can sign up online or at the store. Friday, October 26th: Scissor and Knife Sharpening will be available at the store from 10:00 am-3:30 pm. Just in time for the holidays! Prices are as follows: Fabric Shears $8, Pinking Shears $8, Thread Snips $5, Household Shears $5, Kitchen Knives $5. No appointment needed, just bring your items to the store on October 26th and wait while they get sharpened. November 2nd and 9th: A Kids class on Beginning Quilting from 4:30-6pm both days. Come join Janice for our Beginning Kids Quilting Class! Kids will learn to make a set of quilted placemats just in time for the holiday table setting. This class will be for children ages 10 and up.Each child should complete 2 quilted placemats 12 ½ X 18 ½. The cost for this fun class will be $30.00, which covers both sessions and $9.50 for the kit. Kits for this class are available, which are sold separately, and will include the pattern. November 6th: Sharon Meisenheimer is teaching Intro to English Paper Piecing starting at 1:30pm. Hexies are popping up everywhere in sizes from ¼ inch up. Learn the easy technique of English paper piecing and join the fun of this technique. This great take along technique will help you make accurate grandmother’s flower garden blocks and a whole lot more. November 8th: Pat is teaching Beyond Squares and Rectangles starting at 6pm. 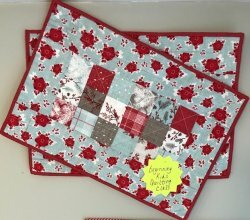 Learn to make strip sets, half square triangles, quarter -square triangles, square in a square, and if time permits, flying geese. With these piecing skills you will be able to make most quilt blocks! A great way to expand your pattern choices. NEW! November 9th: We have a Pfaff specialist coming into the store to do a Crazy Quilt Class on the Performance Icon. This will be a fun quilt top to make and learn all kinds of decorative stitches on the Performance Icon. More information is coming next week on the project and cost. The Preformance Icon Sewing Machine will be provided for you to use. Here is the bio for our Pfaff instructor, Carrie Philpott. Carrie simply loves to sew! She started designing and making her entire wardrobe at 14 years old. This passion has extended into an International journey that has embraced every aspect of the textile and garment industry. Carrie worked on the development of Hi-tech Fibers such as Spandex and microfibers. She also was involved in the training of sewing operatives at several high end British garment factories. Recently, Carrie created a series of Digitized embroideries that she marketed through in-person presentations and internet outlets. From 1998-2004, Carrie owned and managed Main Street Sewing and Vacuum in Vancouver, WA. This expanded her love of sewing in the Embroidery, Digitizing, Crafting, Heirloom and Quilting arenas. She has received certification and training from Sue Hausman, Martha Pullen, Alex Anderson and Connie Crawford. An event led by Carrie will infuse you with inspiration and motivation to expand your sewing, quilting, embroidering love and skills. November 10th: Easy Intentional Improv with award winning Eva Marie Evans starting at 10:30am. Have you ever thought improv piecing looked like fun, but have trouble letting go of patterns and precision? Join us to make an improv block that can be turned into a pillow or joined with other blocks to make a larger quilt. Sample on display in store. Using a familiar intentional piecing technique, we will embrace improv and learn about the importance of color and value in composing our blocks. Improv piecing is the ultimate fabric play. Come have fun with us! NEW! November 16: Sit and Knit Club starting on Friday, November 16th at 1pm. Come join other knitters for a monthly sit and knit club. This is a new club and open to anyone who likes to knit, and would like to knit with other knitters! It's a time to share ideas, get suggestions, develop skills, and relax! The club is free, the classroom is reserved for you from 1-4, so grab a friend, your project(s), and take an afternoon to sit and knit. NEW! December: The second new club, I am totally excited about is the Kimberbell Machine Embroidery Club. Our first machine applique project will be revealed on December 1st. Creekside Quilting is taking an exclusive dealer's project, making a sample, kitting the sample for purchase, and putting the sample on a flashdrive. You must purchase a Creekside Quilting flashdrive for $30 for one year of uploads. then every month we will release our Kimberbell design and you may either chose to upload the design on your purchased Creekside Quilting flashdrive or you can pass until another month. Each upload for the year is free. You will also get first opportunity to buy the kit each month to go with the Kimberbell project. NEW! 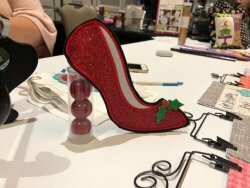 December 12th: All you machine embroidery fans, on Wednesday, December 12th we are going to make this cute Kimberbell shoe from the Kimberbell Sweet Feet CD. 5:30-7:30 pm. Bring your embroidery machines to the store and let's stitch up this cute holiday shoe! All class fees go straight to the instructor. Due to the time each teacher puts into preparing for a class, no refunds will be made for canceling a class within one week of the class date. In the same respect, should we need to cancel a class due to not meeting the minimum amount of students, we will cancel the class one week prior class date and offer a full refund or a class credit toward another class. Sleigh Bells BOM is non-cancelable, non-refundable and your credit card will be kept on file for monthly billing of each kit, OR you may pay for the year upfront. A discount will be given in December 2019 and January 2020 for borders, binding, and backing in order to finish your quilt. 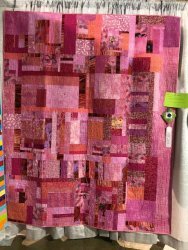 Join Barb each month in 2019 in sewing the Eighth Simple Whatnots Miniature Quilts Club and make a miniature quilt each month using Kim Diehl's new fabric collection Wit & Wisdom. Kim has created eight new simple and beautiful miniature quilt patterns exclusively for this club. Many of the patterns have fun added bonuses such as fun recipes, an extra project or tips and tricks. All eight miniature quilts are quick and easy to complete using basic quilting skills. These little miniatures are perfect for decorative wall hangings and table toppers! Each month you will receive a pattern and fabric to complete a miniature quilt. Batting and backing fabric will not be included each month, but can be purchased each month at a discounted price. This program is from January 2019 to August 2019. Eight Simple Whatnots Miniature Quilts Club is non-cancelable, non-refundable and your credit card will be kept on file for monthly billing of each kit OR you may pay for the eight months upfront. Sign-up will begin November 1st-December 15th . Expected fabric delivery date is January 2019. The weather is changing, so let's put ALL flannels, ALL Cuddle fabrics and kits, ALL Fireside Fabric and the Moda Christmas line Hearthside Brushed, on sale for 15% off full yard cuts. This coupon is for full yard cuts only, and must be mentioned at time of cutting that you want to receive the 15% off. Coupon good from 10/9-10/15. Thank you! Thank you! Thank you! I appreciate your business and support!